Get ready for some brand new TVs. Ahead of the CES 2019 convention in Las Vegas next week, where LG is expected to showcase their new TV ranges for 2019, we've received official confirmation of at least some of the sets that will be tempting your wallets this year. So what can you expect from the South Korean television manufacturer? We're sure to see a lot of new OLED televisions. LG is plunging forward with its popular organic LED (or OLED) screens, with new models of the C9, W9, Z9, W9, and E9 replacing last year's C8, W8, and so on. There's no mention of a successor to the budget B8 OLED, though we could always see it announced later in the year when sales of the flagships have started to slow. LG's 88-inch Z9 OLED will be on sale for those after a huge 8K screen. 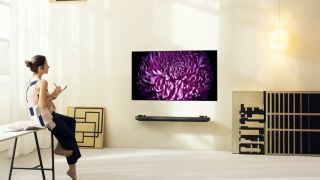 All the new OLED sets for 2019 will come with HDMI 2.1 too, allowing for high-resolution video and audio input from compatible media players and gaming consoles, and smooth motion in action or sports programmes. A new a9 Gen 2 chip will up the image processing and machine learning on offer in LG's OLED sets, and some choice LCD (or 'NanoCell') televisions, improving noise reduction and enhancing brightness and contrast levels depending on the media being played. There's a renewed focus on voice commands, with your good friends Alexa and Google Assistant coming built-in to LG's ThinQ AI smart TVs (2018 TVs only came with Google Assistant). Flagship TVs will also come with Dolby Atmos 5.1 surround sound, while LG's new processor will be able to "up-mix" two-channel audio into 5.1 surround sound: like upscaling for the ears. We're sure to see more at CES this month, though in the meantime there's already plenty to keep us excited for the year ahead – not least LG's rollable OLED television that's expected to come on sale this year.